Starry sky with green haze above a moss covered cliff, with waterfall on bottom right and chromatic bow along bottom. Photo: Stephane Vetter (Nuits sacrees). The Skogafoss is one of the biggest waterfalls in Iceland, and is especially beautiful in this stunning image under the aurora borealis. The Northern Lights are shining against a great sea of stars, including the constellation Ursa major, or Great Bear, home to the asterism — a recognizable cluster of stars — the Big Dipper. And then there’s the rainbow that’s not really a rainbow. 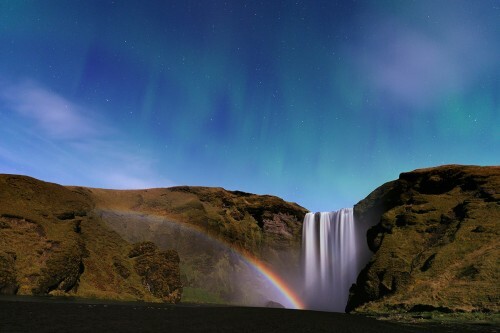 This colorful arch is actually a moonbow, created by the light of the full moon refracting and reflecting in the water droplets that have drifted away from the waterfall. Rainbows are created by sunlight refracting in, and reflecting from, raindrops or mist, even if the light and water source are different. The light is first refracted when it enters a water droplet, as the light wave changes direction because it is slowed more on one side than another. Next, it is reflected off the back of the droplet, and finally it is refracted again on its way out. Upon entering the droplet, the sunlight is separated into different wavelengths, an effect called dispersion. Different wavelengths of light are each different colors. The shorter wavelengths, like blue and purple, are refracted at a greater angle than longer wavelengths, like red and orange. This variation in bending gives rainbows and moonbows their shape.